Contractors have torn out our master bathroom, leaving dust from missing wall board in their wake. In anticipation, I removed everything but the furniture from our bedroom and retreat area and stuck it willy-nilly in our two offices. Next, we learned a plumber will come tomorrow. He needs to work under our house, which meant I had to move books and misc. junk (where else does one put birthday wrapping paper anyway?) that covered this crawl space. And then there’s the mountain of “stuff” from our master bath crammed into a tiny bathroom . . . and cleaning supplies overflowing into the hallway. Sigh. 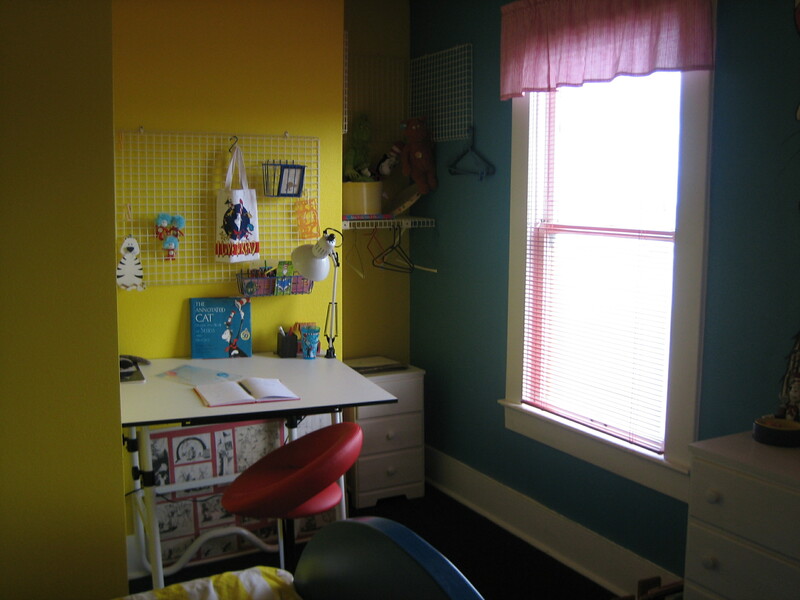 Can you work with clutter overtaking your space? The dog has wedged herself in between a laundry basket and the bathroom scale in the hall, so she can gaze through the dog gate at workers moving in and out through the deck door. After all, she IS the supervisor on this project. other. My walls, however, are fair game for anything! Whenever possible, I keep stuff in e-format. Not that I’ve solved my clutter problem entirely, but at least it keeps it down to a dull roar! Me: Right now, I think my solution is to go over to Camille or Aline’s house. Who among us doesn’t have clutter? As writers, paper and book clutter can overtake our writing spaces if we’re not careful. If you are at all sentimental, love family history, or have other passions, clutter control may take serious and professional clutter buster help. After our son graduated from college, we finally clutter-busted our home, tossed the sagging couch in the living room, and created offices out of bedrooms. When Tofer (short for Christopher) walked in our front door, we proudly showed him our new furniture. We had moved my “slouchy” chair into the family room, and its accompany stack of books. Tofer stood in silence for a moment, soaking in the new ambience. We proudly observed our new clutter-free space. The new white couch, blue carpeting, and piano (music safely tucked away) shone with empty space around them. Next, he made his way into the kitchen and family room. There we had left our magazines, stacks of books, slouchy chair and dog toys scattered about. “Ah,” he said. “This is more like it. THIS is home.” He threw down his backpack and duffel bag and jumped onto the couch. Kicking off his shoes, they landed in the pile of dog toys. He was right. This is how we lived. For a look into my office, visit author Jennifer Bertman’s Blog. 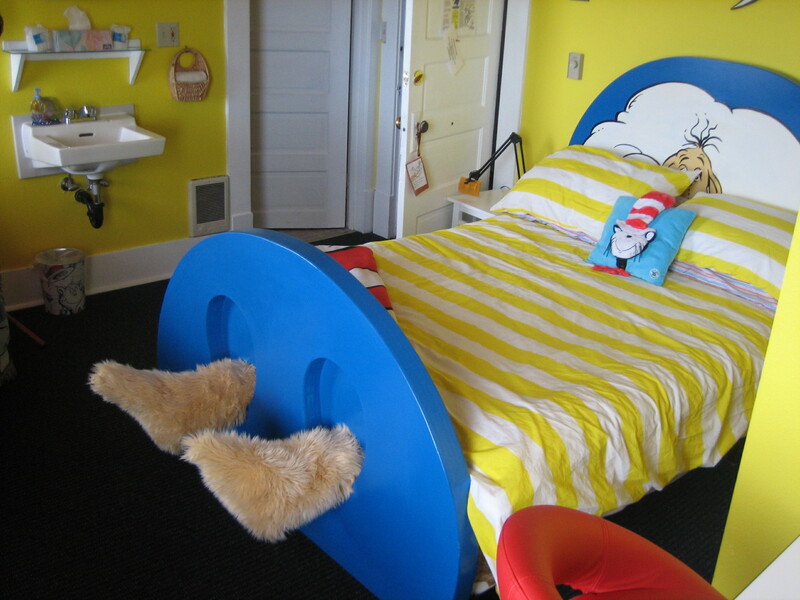 The Sylvia Beach Hotel’s Dr. Seuss room is a delightful mixture of childlike fun, primary colors, and of course, SEUSS! We stayed next to it in Agatha Christie (larger room facing the ocean) but if I were coming up to this Oregon B&B by myself I’d book this one for writing inspiration. 1. 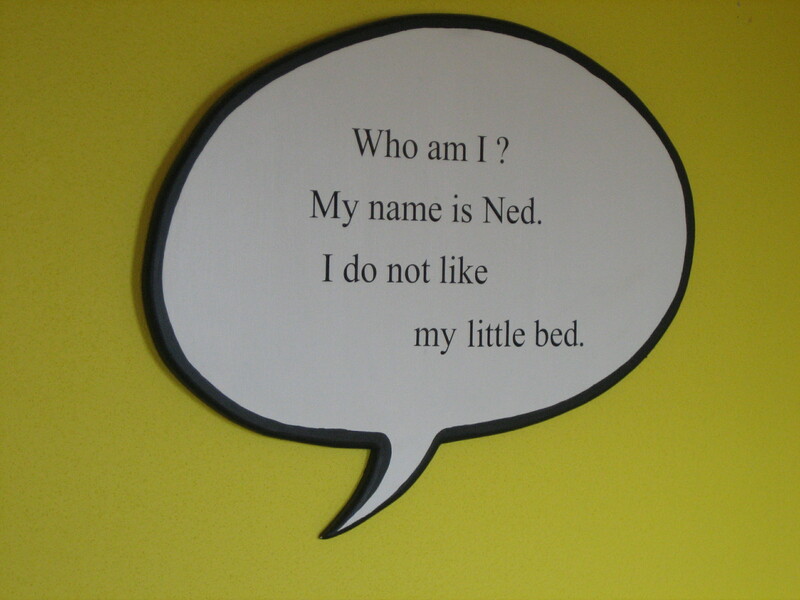 Use Dr. Seuss to inspire your writing. Write rhyme. 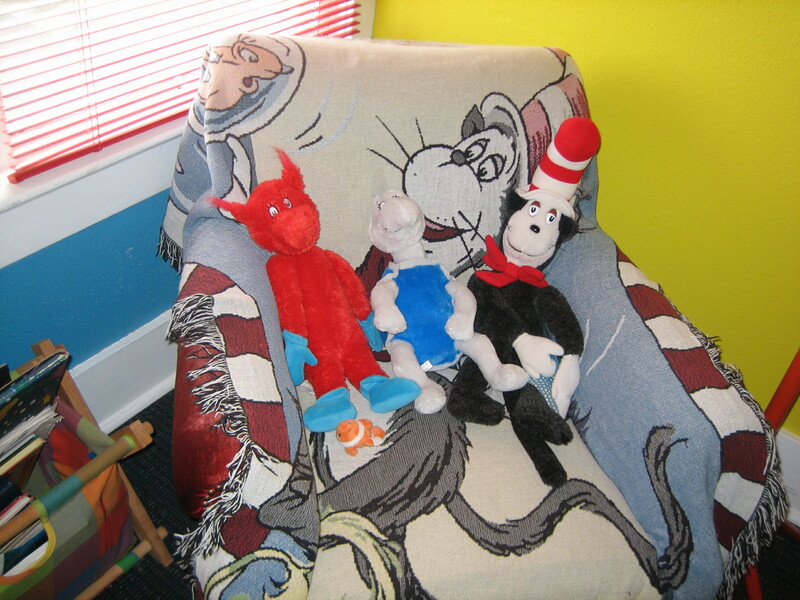 Read Dr. Seuss to get you in the mood of course! 2. You have every writer’s fantasy. You are allowed a month at a retreat. You can go anywhere you want to go. You may bring any reading and writing projects with you. What will you work on? What are your writing goals? 3. What’s stopping you from starting those writing goals NOW? Remember Anne Lamott’s advice in Bird by Bird. Just write a little bit at a time. Don’t look at the huge book, article, paper, or website. Just try writing a paragraph per day or whatever YOU can manage. 4. Give yourself a goal. Cut back on television, surfing the web, socializing, or all of the above. Give yourself 20 minutes a day to write ANYTHING. 5. Check off the days on the calendar when you stick to your plan. Pretty soon you’ll develop a writing routine. THEN you can call yourself a writer! 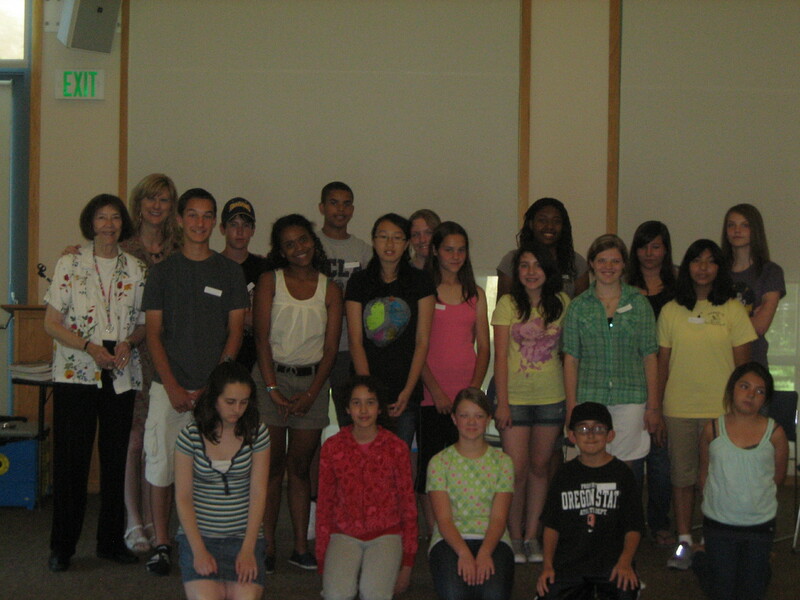 Sarah Wilson (nickname = Susie) and I led middle and high school students in a mystery and suspense writing workshop yesterday at the Clayton Library. Students wrote terrific tales of terror and mystery. Fabulous talent in this group! Susie and I wish WE were this good when we were this age. Some students even are writing novels! Keely Parrack returns to teach her popular writing classes. The theme this summer is Dectectives. Keely is a writer and educator. Discover clues, crack codes, develop your own mystery stories and have a heap of fun. This is a creative writing class studying character, place, and plot. $125 per week or $25 per day. On Saturday at our local writer’s club, author Sophie Littlefield (A BAD DAY FOR SORRY, A BAD DAY FOR PRETTY) spoke to us about actually getting down to writing. What holds you back? Do you procrastinate? Actually, we don’t know any writer who DOESN’T procrastinate . . . If you’re confident, it’s easy. You won’t procrastinate. Fear makes us put off the hard stuff. Sophie suggests giving ourselves concrete goals. Write ____ words a day. Read _____ words a day. Sit there 45 minutes and write. Even if you can’t write, STILL sit there for 45 minutes! Then you can take 15 minutes off. 4. If I’m blocked, it always helps to read a little first. It may be something inspirational. 5. If you are spiritual, say a prayer or meditate. Or daydream a bit. The trick is to relax and go with the flow and LET GO. I’d go on with this list, but I think I’ll do it later . . . Cost: FREE! 3:00 – 5:00 p.m.
A fun treasure hunt and a mystery boat. Who did it? Did what? Why? Discover how mystery, suspense and intrigue will make your good story better. Two professional authors who love writing lead this interactive workshop. Bring your questions about the publishing world, write, meet other writers, “talk books,”go on an adventure and be inspired to write and publish your own works of prose. For student writers who want to make their good writing even better. Take your writing to the next level! Open a book of art or photography, a newspaper or magazine. Which painting or photo do you see? Let it inspire a poem, short story or allow it to remind you of a memory in your life.